“Foreign Terrorist Organizations,” U.S. Department of State, accessed February 7, 2017, https://www.state.gov/j/ct/rls/other/des/123085.htm. Saeed also heads a charity called Jamaat-ud-Dawa (JuD), which the Indian government has implicated in financing LeT attacks.Neil MacFarquhar, “India Wants Pakistani Group Added to U.N.’s Terrorism List,” New York Times, December 9, 2008, http://www.nytimes.com/2008/12/10/world/10nations.html?_r=0. In January 2017, Saeed was placed under house arrest in Pakistan for disturbing peace and security, but was released that November in a move criticized by the United States and India.“Pakistan puts Lashkar-e-Taiba founder Hafiz Saeed under house arrest,” Hindustan Times (New Delhi), January 31, 2017, http://www.hindustantimes.com/world-news/mumbai-terror-attack-mastermind-hafiz-saeed-under-house-arrest-in-pakistan/story-jAdoYoe9I5Ck5f6mOstUrJ.html; Imtiaz Ahmad, “Hafiz Saeed’s JuD gets a new name with a Kashmir connection,” Hindustan Times (New Delhi), February 7, 2017, http://www.hindustantimes.com/world-news/hafiz-saeed-s-jud-gets-a-new-name-after-crackdown-by-pak-calls-itself-tehreek-azadi-jammu-and-kashmir/story-jScxjcTGfKab9o4AM0NkjL.html; Sophia Saifi and Joe Sterling, “Accused Mumbai attack mastermind freed from house arrest in Pakistan,” CNN, November 24, 2017, http://www.cnn.com/2017/11/24/asia/mumbai-suspect-freed/index.html. Saeed’s family migrated from India to independent Pakistan during the partition of British India in the late 1940s. Raised in the Punjab province of Pakistan, Saeed received degrees in Islamic studies and engineering. He studied in Saudi Arabia while employed by General Zia-ul-Haq—Pakistan’s longest serving President.Neil Padukone, “The Next al-Qaeda? Lashkar-e-Taiba and the Future of Terrorism in South Asia,” World Affairs Journal, November/December 2011, http://www.worldaffairsjournal.org/article/next-al-qaeda-lashkar-e-taiba-and-future-terrorism-south-asia. Saeed was heavily influenced while living in Saudi Arabia. Encouraged by interactions with extremist clerics—including Osama bin Laden’s mentor Abdullah Azzam—Saeed traveled to Afghanistan to fight against the invading Soviets. He founded LeT in Pakistan in 1990, according to the U.S. and Indian governments. At its inception, LeT trained volunteers to fight alongside the Taliban against Soviet forces.Neil Padukone, “The Next al-Qaeda? Lashkar-e-Taiba and the Future of Terrorism in South Asia,” World Affairs Journal, November/December 2011, http://www.worldaffairsjournal.org/article/next-al-qaeda-lashkar-e-taiba-and-future-terrorism-south-asia. “Information that brings to justice… Hafiz Mohammad Saeed,” Department of State, accessed February 6, 2017, https://www.rewardsforjustice.net/english/hafiz_saeed.html#. Pakistan has long allowed LeT members to operate within the country. However, since 2006, the Pakistani government has subjected Saeed to a series of house arrests and trials relating to a variety of criminal- and terrorism-related charges, including his alleged involvement in the Mumbai attacks.Staff Report, “Complete Profile of Hafiz Saeed,” Daily Times, April 7, 2012, http://archives.dailytimes.com.pk/national/07-Apr-2012/complete-profile-of-hafiz-saeed. Hanne Coudere and Aftab Chaudry, “Interview: Hafiz Muhammad Saeed,” Diplomat, June 4, 2015, http://thediplomat.com/2015/06/interview-hafiz-muhammad-saeed/. Under Saeed’s leadership, LeT has partnered with aid organizations in Gaza.Ariel Ben Solomon, “Pakistani Terrorists Doing Charity in Gaza, Report Says,” Jerusalem Post, December 11, 2014, http://www.jpost.com/Middle-East/Pakistani-terrorists-now-doing-charity-in-Gaza-384290. Following Saeed’s January 2017 arrest, his charity, JuD, rebranded itself as Tehreek Azadi Jammu and Kashmir (TAJK).Imtiaz Ahmad, “Hafiz Saeed’s JuD gets a new name with a Kashmir connection,” Hindustan Times (New Delhi), February 4, 2017, http://www.hindustantimes.com/world-news/hafiz-saeed-s-jud-gets-a-new-name-after-crackdown-by-pak-calls-itself-tehreek-azadi-jammu-and-kashmir/story-jScxjcTGfKab9o4AM0NkjL.html. On November 24, 2017, Pakistani authorities announced that Saeed had been released from house arrest earlier in the week after the Lahore High Court concluded that there was “nothing tangible” in the evidence presented against him in a government request to extend his detention. The United States and India released statements criticizing the move.Jessica Donati, “U.S. Criticizes Pakistan for Freeing Terror Suspect From House Arrest,” Wall Street Journal, November 24, 2017, https://www.wsj.com/articles/u-s-criticizes-pakistan-for-freeing-terror-suspect-from-house-arrest-1511567469; Sophia Saifi and Joe Sterling, “Accused Mumbai attack mastermind freed from house arrest in Pakistan,” CNN, November 24, 2017, http://www.cnn.com/2017/11/24/asia/mumbai-suspect-freed/index.html; Asad Hashim, “Pakistan releases Hafiz Saeed from house arrest,” Al Jazeera, November 22, 2017, http://www.aljazeera.com/news/2017/11/pakistan-releases-hafiz-saeed-house-arrest-171122113033590.html. Hafiz Sahib“Sanctions List Search,” Office of Foreign Assets Control, accessed January 31, 2017, https://sanctionssearch.ofac.treas.gov/Details.aspx?id=2084. The U.S. Department of Treasury designated “Hafiz Saeed” as a Specially Designated National (SDN) on November 1, 2007.“Sanctions List Search,” Office of Foreign Assets Control, accessed January 31, 2017, https://sanctionssearch.ofac.treas.gov/Details.aspx?id=2084. 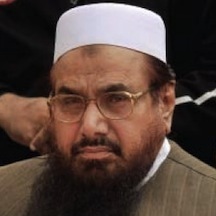 The United Nations placed sanctions on “Hafiz Muhammad Saeed” per resolution 1822 (2008) for his affiliations with “Lashkar-e-Tayyiba” and “Al Qaida.”“Narrative Summaries of Reasons for Listing,” United Nations, March 9, 2009, https://www.un.org/sc/suborg/en/sanctions/1267/aq_sanctions_list/summaries/individual/hafiz-muhammad-saeed. Pakistani-born Hafiz Muhammad Saeed is a U.S.- and U.N.-designated terrorist. “Come to us [LeT]…We will teach you the meaning of jihad…. The time to fight has come.”Bill Roggio, “We do jihad,’ says Lashkar-e-Taiba emir Hafiz Saeed,” Long War Journal, April 7th, 2012, http://www.longwarjournal.org/archives/2012/04/we_do_jihad_lashkar.php. “There are many parties in Pakistan, but America has only sent a message to Jamaat-ud-Dawa, because we do jihad. They [U.S.] are even scared of my name.”Bill Roggio, “We do jihad,’ says Lashkar-e-Taiba emir Hafiz Saeed,” Long War Journal, April 7th, 2012, http://www.longwarjournal.org/archives/2012/04/we_do_jihad_lashkar.php. “America should leave Pakistan and Afghanistan peacefully. Then, we will not come to you with guns but will instead invite you to Islam.”Bill Roggio, “‘We Do Jihad,’ Says Lashkar-e-Taiba Emir Hafiz Saeed,” Long War Journal, April 7, 2012, http://www.longwarjournal.org/archives/2012/04/we_do_jihad_lashkar.php. “There cannot be any peace while India remains intact. Cut them, cut them so much that they kneel before you and ask for mercy.”Arundhati Roy, “The Monster in the Mirror,” Guardian (London), December 12, 2008, http://www.theguardian.com/world/2008/dec/12/mumbai-arundhati-roy. “[Pakistan] should not solicit help [for the victims of the 2005 earthquake] from Israel. It is the question of Muslim honor and self-respect. The Jews can never be our friends. This is stated by Allah.”Ashley J. Tellis, “The Menace That Is Lashkar-e-Taiba,” Carnegie Endowment for International Peace, 5, March 2012, http://carnegieendowment.org/files/LeT_menace.pdf. “…our struggle will continue even if Kashmir is liberated. We still have to take revenge for East Pakistan.”Ashley J. Tellis, “The Menace That Is Lashkar-e-Taiba,” Carnegie Endowment for International Peace, 4, March 2012, http://carnegieendowment.org/files/LeT_menace.pdf. “…jihad is not about Kashmir only…about fifteen years ago, people might have found it ridiculous if someone told them about the disintegration of the USSR. Today, I announce the break-up of India, Insha-Allah. We will not rest until the whole [of] India is dissolved into Pakistan.”Ashley J. Tellis, “The Menace That Is Lashkar-e-Taiba,” Carnegie Endowment for International Peace, 3, March 2012, http://carnegieendowment.org/files/LeT_menace.pdf. “…many Muslim organizations are preaching and working on the missionary level inside and outside Pakistan . . . but they have given up the path of jihad altogether. The need for jihad has always existed and the present conditions demand it more than ever.”Ashley J. Tellis, “The Menace That Is Lashkar-e-Taiba,” Carnegie Endowment for International Peace, 8, March 2012, http://carnegieendowment.org/files/LeT_menace.pdf. “There cannot be any peace while India remains intact. Cut them, cut them so much that they kneel before you and ask for mercy.”Arundhati Roy, “The Monster in the Mirror,” Guardian, (London), December 12, 2008, http://www.theguardian.com/world/2008/dec/12/mumbai-arundhati-roy. “Osama bin Laden was a great person who awakened the Muslim world….. Martyrdoms are not losses, but are a matter of pride for Muslims,” Saeed proclaimed. Bill Roggio, “We do jihad,’ says Lashkar-e-Taiba emir Hafiz Saeed,” The Long War Journal, April 7th, 2012, http://www.longwarjournal.org/archives/2012/04/we_do_jihad_lashkar.php. “Our struggle with the Jews is always there.”Ashley J. Tellis, “The Menace That Is Lashkar-e-Taiba,” Carnegie Endowment for International Peace, 5, March 2012, http://carnegieendowment.org/files/LeT_menace.pdf. “[LeT plan is to] plant the flag of Islam in Washington, Tel Aviv and New Delhi.”Ashley J. Tellis, “The Menace That Is Lashkar-e-Taiba,” Carnegie Endowment for International Peace, 4, March 2012, http://carnegieendowment.org/files/LeT_menace.pdf.